7pm Friday, December 5th 2014. 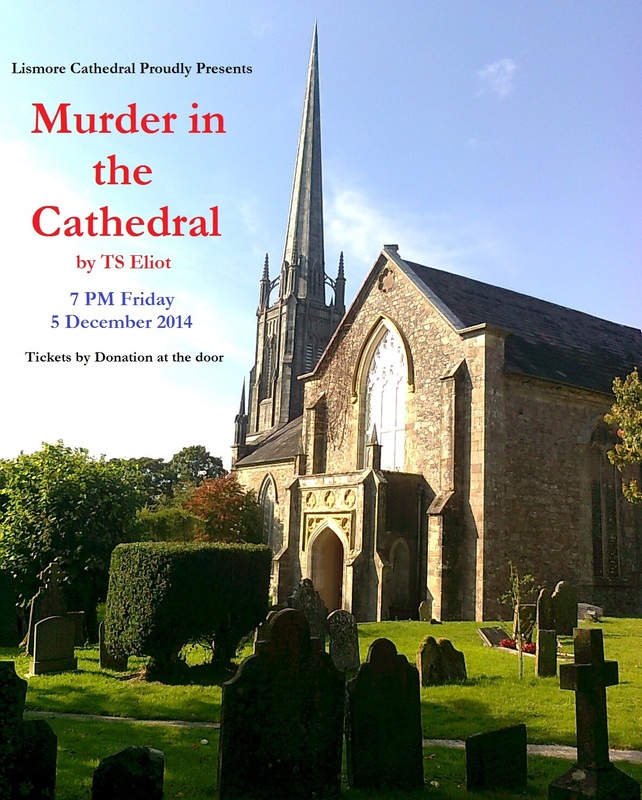 This December, as part of Advent celebrations, and to celebrate theatre and art in Co Waterford, Lismore Cathedral is very proud to present TS Eliot’s renowned play, “Murder in the Cathedral”. Starring 22 people from all around West Waterford, including professional actors, the play (7PM, Friday 5 December 2014) is all about the murder of Thomas a Becket in 1170 by noblemen acting on behalf of King Henry II. A magnificent and very accessible play about the duties we have to God, and the choices we all must make when it comes to earthly riches or power, the performed reading is a chance to see one of the 20th century’s key dramas. Written by TS Eliot, who won the Nobel prize for Literature, “Murder…” is rich with language and beautiful to listen to. Starring local children, teenagers and adults from all sorts of backgrounds, as well as members of the Cathedral Choir, the evening is something very special. The Very Reverend Dean of Lismore Cathedral, Paul Draper, and his wife, Music Teacher Kathryn Storrs, are themselves taking part. Directed by James Hyde, the performance is completely open to everyone. Tickets are by donation at the Door, and also available on the night will be copies of Lismore Cathedral’s beautiful 2015 Calendar. Please wear warm clothes and bring a blanket. Also, from 6 to 6.45PM, an hour before the main play, will be a very interesting talk by UCC Historia Dagmar O Riain-Raedel, “Murder & Mayhem in Lismore Cathedral: The Events of 1163”. On in the Red Hall (3 minute walk from the Cathedral, with excellent heating! ), tickets cost just €5 and the talk will give a fascinating overview of the murderous politics of the Deise and Munster at the time. “Murder in the Cathedral” is open to all, no matter your age, faith or background. This entry was posted on November 20, 2014 by waterfordarts in General, Performance and tagged 1170, Lismore, Lismore Cathedral, Theatre, Thomas a Becket.